HJ: When we learn to go with the flow, life becomes effortless. What you need comes into your life at the perfect timing, not a moment sooner or later. However, the caveat is that what you need and what you desire are often two different things. Most people have been conditioned to think and believe that life is not easy, that there must be struggle involved, but I assure you, it can absolutely be effortless. Effortlessness comes into our lives when we let go and trust where we are being led. This is a big, scary step for many people because they don’t trust that they will be given exactly what they need. They may have been living against the flow for so long that they just don’t believe it is possible because their whole life has involved struggle. This is a very common situation and the only remedy is to bring oneself in alignment with ones passions, begin to do the inner work, relax and trust that everything will happen exactly as needed. To elucidate the flow state a bit more, I can describe it as follows. You are totally at peace in the moment and are just enjoying the ride. Sure, you get your errands done and whatever work is on your plate, but the perspective and feeling you hold is one of being synchronistically led through life from your heart. Instead of struggling to get things done, you listen and FEEL it all out. If it doesn’t feel right, you don’t do it, even if it is on your to-do list. If it feels right and uplifting and your heart says yes, you do it, even if you didn’t allot time for it. This requires trust and detachment from the limits and deadlines of the rational mind. Flow is a state we tap into by operating form the heart and feeling our way (instead of thinking) through life. In the past few weeks I was reminded how easy it is to let yourself being pulled out of the flow. With the Christmas holiday coming closer every day, there is so much effort going on to get stuff finished or cleaned up before year end. Deadlines for projects, last minute attempts to realize personal targets, but also the brushing up of balance sheets, the list goes on with things that have us easily move “upstream” instead of “downstream”. If you are wondering if you are going upstream, against the flow, the following signs may help you recognize this. You feel more tired than usual. I could go on with the list, but in essence the best sign to tell that you are not in the flow is how you feel. You will generally feel resistance in everything you do before anything else. If you are currently suffering from these symptoms your first reaction may be, oh my God, this is bad, I have to get back in the flow right now. Well, this may sound a little strange, but you are not doing anything wrong when you are out of the flow. Actually, it may be fun to go upstream for a while. For many it is a sign that they are really alive and kicking. There is nothing “bad” about it, but you may come to a point that you get tired of it and want to go downstream again. 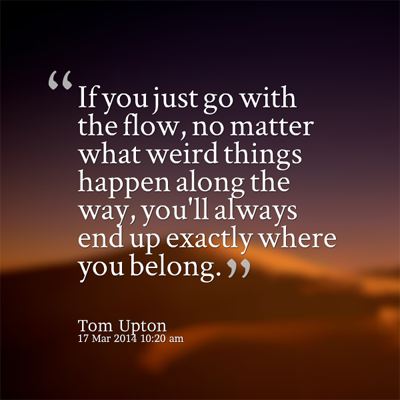 Often people think that it is the circumstances that pull them out of their flow. Your boss that insists that you finish something, which takes a lot of effort on your part. Or, certain problems that you think require your immediate attention and result in a lot of push back when you are trying to solve them. Actually, it is your inner vibration that determines if you are in, or out of the flow. Remember that Law of Attraction? When you experience struggle in your reality it is reflecting your vibration and nothing else. And the way you vibrate is ultimately a choice as you may have discovered by now. So staying in the flow is a choice also. For many people going with the flow or following the path of least resistance is something that has a negative ring to it. It is quickly associated with things like laziness, lack of purpose or direction or even a lack of ambition or desire to achieve things. Putting in hard work, or effort, to achieve what you want is generally considered a positive aspect in one’s character. In order to bring yourself back into the flow you may want to explore these beliefs a little more and decide if you want to continue adhering to them. Who created these beliefs anyway? What feels better to you in the end, going upstream or going downstream with the flow? If you find this difficult to accept you may want to listen to this channel withAbraham (9:35) explaining how going with the flow is the key to enjoy life. Which brings us to the things you can do, the choices you can make, to stay or return into the flow. Let me share some of the things that help me. One of the first things that help me going downstream again is to listen to my feelings. Let me give you an example. The other day I had been very busy and in the afternoon I was supposed to finish something before I would leave the office. However, I increasingly felt that it would take me a lot of effort to get it done because I lacked both the inspiration and motivation. I experienced increasing resistance within myself to complete the task. I actually felt more like going to a movie and that’s what I did. At 3:30PM, I sneaked out of the office and went to a nearby movie theatre. I had a great afternoon and quickly felt back into the flow. The next day I took care of the unfinished business in no time. Generally, when I am moving upstream it is reflected in the kind of thoughts I have. So, one of the things you can do to bring yourself back into the flow is to change your thought patterns. Just observe what you are thinking about and make a conscious choice to focus your attention on other things. For example, you may find yourself struggling with a problem, thinking of possible solutions over and over again without any result. In moments like that just change your focus to those things you can get easily done or solved. I usually have a lot of different things I can do anyway so when I feel something taking too much effort I simply switch to something easier. This quickly brings you back into a feeling of flow and you will notice that the solution to the other problem may just come to you when you least expect it. Which brings me to the third thing you can do to get back into the flow. As I said in the beginning your level of vibration determines what you attract and experience. If you experience a lack of flow you may want to raise your vibration so you experience things going more smoothly. But, how do you change your vibration? There are many ways but I generally use two things: breathing and music. I find it amazing how conscious breathing will help me change my vibration. If you find yourself struggling against the flow, just take a break and do some conscious breathing and you will experience for yourself how easy it is to raise your vibration and get back into that feeling of flow. It is the tool spiritual teachers suggest most and you always have it with youJ. The other thing I often use is music. How often have you put on some music when you felt down or frustrated because it helped you feel better? The same applies when you want to change your vibration. Just put on the music you enjoy most and allow your vibration to be raised without any effort on your part. Have you ever taken a moment out of a busy day to look at nature? Depending on what time of year you are reading this, if you look out a window, you will witness a number of things going on. You might see snow falling or rain pouring from the heavens. You might see a beautiful sunny day with tall trees and branches filled with leaves or birds flying in the sky. As the seasons pass, you witness a change in nature that is natural and timeless. The trees and grass don’t fight the change of seasons. Nor do birds or other animals, plants or flowers. The sun doesn’t argue with the clouds when rain or snow falls. Nature just does. Nature, naturally, follows the Universal Law of Flow. Life, like nature, follows the Universal Law of Flow. Our spirit is born into a physical form, we experience life, and then we shed our physical form. Our ideas and goals also follow the Universal Law of Flow. They begin with our thoughts and ends with a result or effect. The Universal Law of Flow dictates that there is a natural flow or rhythm to everything. You can’t rush spring after winter or rush a tulip bud to break soil and become a beautiful flower. You can whine and complain about winter being too cold, but that won’t speed up spring. You can sit in your garden and shout at your tulips, but they won’t grow any faster. So, if nature has a flow, why do many people think that they are above that? People understand that it takes time for nature to turn a tulip bulb into a tulip, yet can’t understand why it takes time for their ideas to become reality or goals to be accomplished. People don’t like to wait for the situation (seasons) to change. We are impatient and demand quick results. Strangely enough, due to our impatience, we tend to focus our thoughts on the observation that what we desire is not here yet. In other words, we focus on what we lack or don’t have. Thinking thoughts of lack actually hinders the process of having our ideas and goals become reality, because instead of focusing on what we want – an accomplished idea or goal – we focus on lack. And, what you focus on you get. The Universal Law of Flow requires meekness. What do I mean by meekness? I’m sure that you have heard the saying of Jesus, “The meek shall inherit the Earth.” Meek doesn’t mean weak or inactivity. By meek, Jesus meant humble. Standing back, focusing on the outcome that you desire, knowing that it is already accomplished and waiting for the Universal Flow to bring this desire into physical or visible form is meekness. Meek means being patient and being willing to put your ego aside, stand back, and let the Laws work. When it comes to our ideals and goals, we often set up time parameters and become upset, if they are not met. Why do we feel the need to set up time parameters for everything? Albert Einstein once said, “Time was invented by man, due to his incessant need to compartmentalize everything.” He was right. We place time limits and demands on other people to “perform” the way we “want then to,” and we put time limits and demands on the Universe or God to deliver our ideas and goals into reality, when we want them. Putting a timetable or demand on when your idea or goal should become reality is about as effective as trying to demand when winter should become spring. According to man, the first day of winter is around December 21st, but how many times does it snow in November? According to man, the first day of summer is June 21st, but how often does the heat index zoom off the chart, before that day? Nature doesn’t follow time; it just flows. Nature is meek in that it follows the Universal Laws that have been put into place by a Universal Power or Spirit or God. Like nature, we need to be meek. We need to focus on what we want and recognize that it is already accomplished (Matthew 6:8 – “God knows what you need before you ask.”) Then we must stand back, be patient, and go with the flow, by waiting for the Universal Law of Flow to take our ideas and goals and bring them into material form.